AIDSWALK Tucson celebrates its 30th anniversary this year and its 8th year of unique partnership with TMY. We share grounds with the event on Sunday morning, allowing each of our organizations to share resources and offer mutual support. AIDSWALK Tucson raises funds for the care services, prevention programs, and LGBTQ initiatives of the Southern Arizona AIDS Foundation (SAAF). The famous NAMES PROJECT quilt can be considered the largest folklore project in the world. 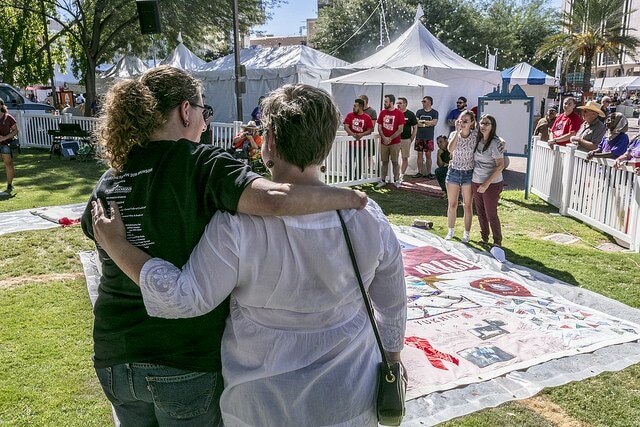 It invites family members and friends of those who’ve died of HIV/AIDS to create quilt panels to commemorate their loved ones. After the walk, a ritual unfolding of quilt panels and naming occurs in a moving ceremony. SAAF will also offer free HIV testing at the festival.